A while back I announced with great fanfare that I was ripping out Lindsay (which had been created by ripping out Francine) in order to make Tina. I signed up for Alison's Spring Fling-a-long and eagerly got started. I started with some leftovers of the Denim Silk, but that didn't get me very far before I had to start dissecting Lindsay. I ripped the front, gave the yarn a bath and kept knitting. The smart thing would have been to rip ALL of Lindsay at the same time, bathe ALL of the yarn at the same time and then start knitting. But I didn't, I only did half. Why? Because I am lazy. I got halfway up the front of Tina before I had to stop for lack of usable yarn. Did I then rip the rest of Lindsay? No. Why? Because not only am I lazy, but I am also easily distracted. Why go through the tedious process of ripping and washing yarn when I could be working on my mom's Waikiki Tank? Or the log cabin blanket? Hello, I have the attention span of a gnat. Nice to meet y... hey, is that an ice cream truck? Anyway, I finally did it. 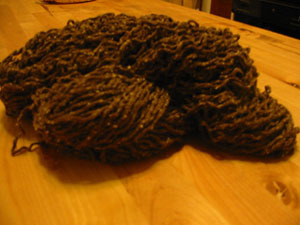 Lindsay is officially No More, and this yarn has been rinsed and wound into balls. Now if I can only stop making so many dang mistakes on the cable pattern, Tina should make her debut very soon! Jason and I are back from vacation, and boy do I have a lot of knitting-related news to post about! Since Saturday was the first day of Spring, we'll start with my Spring Fling project. Some of you may remember Francine, the cute halter top that went so very wrong. If you missed the saga, the short story is that after several attempts to "alter the halter", I frogged the whole thing (long story here). I went on to use the yarn (Berroco's Denim Silk) to make Lindsay, which was a significantly less stressful endeavor and turned out just fine. End of story, right? Not exactly. For whatever reason, Lindsay has fallen into the "eh" category of my closet -- she's just hung there, unworn. It bugged me endlessly ('What a waste of good yarn! '), but I still didn't wear it. 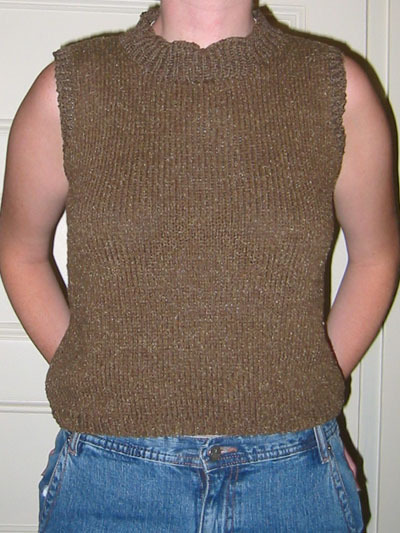 One day, I think it was in Alison's comments, somebody mentioned that Berroco had a free tank pattern posted on-line. Never being one to pass up something free without at least a look, I rushed over and checked it out. Whattayaknow, it was cute, potentially flattering, and, most importantly, made out of Denim Silk! Needless to say, Lindsay is no more. I had hoped that the yarn would be useable as-is, but no such luck: it needs washing. Luckily for me I had a skein and a half of unused Denim Silk left over from Lindsay -- so I swatched and cast on with that. Keep your fingers crossed that the third time is the charm! Exactly two weeks after bidding Francine and not-so-fond farewell, she has been recreated in the form of Lindsey. It would be an understatement to say that this pattern knits up quickly. Remember when I off-handedly mentioned that I hoped I'd have enough yarn? The pattern calls for four-color striping, and this made it difficult to estimate the total yardage for the top since the pattern calls for at least one skein of each color regardless of whether the whole thing would be used. I was right to be worried. 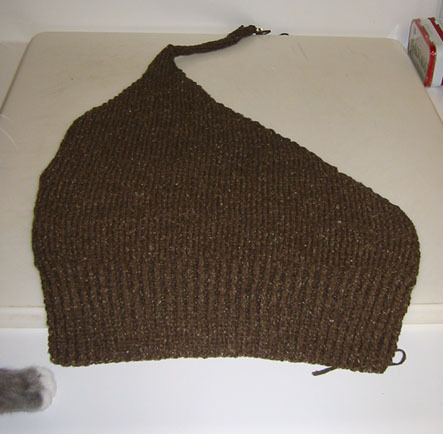 I was just about finished with the back and the front (but not the neck and the armbands) when I ran out of yarn. You'll remember that I bought this yarn in June of this year in New York, so finding one last skein of Denim Silk in Chocolate from the correct dye lot was pretty much out of the question. So I broke a cardinal knitting rule -- I mixed dye lots. Since the yarn is 80% rayon, I figured that chances were pretty good that the color would be uniform even across dyelots, and it was. The only noticeable difference is that the yarn from the newest skein looks less "handled", something that I'm sure will fade with time, wear, and laundering. So why did I stick it out with Francine? My typical answer has been to exclaim that the yarn was really expensive, therefore displaying for all the world that even though I was a teaching assistant in economics, the concepts of sunk cost and opportunity cost did not, in fact, sink in afterall. The truth is, I don't know -- I wasn't even sure that I was going to like Lindsay until after I finished it -- but I do like it, and I'm glad I stuck with it. Anticipating this outcome, I made sure to invest in an a Berrocco book that featured a few patterns made with Francine's yarn (Denim Silk) so that I had an alternative. Then, last night at KnitSmiths I starting frogging and boy did it feel great. Alison gave me some pointers on making hanks (but not this kind of Hank! ), and Sandy, Kerstin and de Yentala (!!!) cheered me on as I ripped and ripped and ripped. Everybody, meet Lindsay. (Obviously, I'm making a stripe-less version. If I have enough yarn. Heh.) Here's hoping that she's nicer than Francine! *Alison, I used that expression just for you! I took Francine home to my mom for her advice last weekend, but we didn't have time to do any fixing. Hopefully we'll get to it this weekend, when she and my dad arrive in Boston to see how much progress Jason and I have made on the apartment! All I have to say is that if this version of Francine doesn't work out, I don't know what I'm going to do. The yarn (Berocco Denim Silk, 20% silk and 80% rayon) is starting to look somewhat worse for the wear after two knittings. So give it to me straight, fellow tejedores: if I have to frog this halter, can the yarn be salvaged? Just a little update on my progress in Francine, version 2.0. I'm still optimistic that re-writing the pattern will solve my strange-body-shape problems, but I've had to re-re-write it in a few places when it became obvious that my revisions weren't going to work out. Since I am the great shoulder-less woman, I had doubled the armhole decreases to narrow the shirt in the chest and up to the straps. (The whole thing was too big in the chest in the beginning -- from armpit to armpit, I am very narrow.) Doubling the decreases turned out to be a little too aggressive, I've frogged down to the start of the armhole and am now alternating the decreases between 1X and 2X. If the re-write (or the re-re-write, I should say), turns out to have been successful, there should be pictures in the next few days! I made really good progress on this totally adorable pattern and was so excited to seam it and finish it. As is my habit, I didn't post any "in-progress" pictures because it would have meant putting down the needles while I was making good time. When I finished, I eagerly seamed the sides and slipped it on to adjust the halter straps. I was excited, but much to my dismay, it looked stupid. It was baggy in front around my waist, the back drooped and the halter straps were too wide. So I did what any 28-year-old with a garment problem would do... I took it home to my mom. I tried it on and stood in front of a mirror while she pulled, pinned and stretched the tank. Then she delivered the bad news: if I wanted it to look right, I had to frog the whole thing, re-write the pattern to allow for my lack of a defined waist and freakishly narrow shoulders, and re-knit it. We sat down with the pattern schematic and took out some increases, doubled some decreases and I started frogging. I've cast on again and am about half way up the back. Here's hoping it works better this time! I went to my LYS the other day to pick up some yarn for a(nother) baby project and I was almost out the door with minimal damage to my bank account when they lured me back in. One of them, who had just helped me pick out colors for the baby present, caught me admiring Francine. Somebody at the store had knit it up in Chocolate and put it on a mannequin right by the cash register. When she asked me if I liked it, I said that I did but that the halter style usually looks silly on me. You'll notice that I'm doing it sans the Mirror FX yarn accents. This is the way that it was on the floor sample at the store, and I really liked the muted neutral brown color so I decided to skip the sequins. Obviously, the top looked much better on me than I had anticipated, but there were still two problems. First, it was a little short. This was not surprise since I'm long-waisted. Second, it gapped in the back. 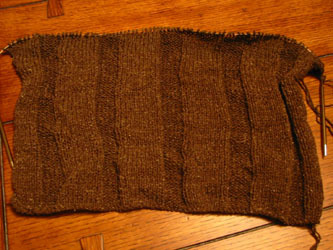 On the advice of the (same persuasive) woman at the store, I added a half-inch to the ribbing for length. I'm also knitting the front panels first so that I can see if I need to make any size adjustments in the back to keep it from gapping. Note: While I was taking the above picture, Sammie (Jason's cat) jumped up onto the counter to inspect the piece; you can see her little gray paw at the bottom of the frame. Next, she sniffed the knitting throughly, which piqued Boogie's interest. So he jumped up on the counter as well, which led Sammie to sit next to the knitting territorially. I rescued Francine just as the huffing and stalking began. Silly kitties.